RNC (Rainy Night Creations) is a young development studio that's already delivered a fairly accomplished effort with FreezeME, a 3D platformer that drew heavy inspiration from the N64 era along with some modern aspects. The studio's next title also looks to add its own twist to an established genre, in this case the earliest Resident Evil titles of the '90s, in particular the first entry in the series. 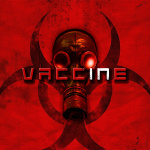 Vaccine takes place within a large house - early hit for references - and gives you a choice of two characters; you have a limited time to find a vaccine for an infested friend. On top of that you have to solve the 'mystery' of the house to truly solve the problem. This title is coming to a range of systems, including Wii U. Nintendo's system was initially given a 'March' release date, but it'll now be matching up to other platforms and arriving the same week. It lands on the European eShop on 23rd February, and will 'probably' hit North America on the same day - final confirmation is yet to come for that; it'll cost $9.99 / €9.99 / £8.99. Are you tempted to give this slice of 'new retro' a try on Wii U? Tank controls are back like it's 1999! Looks pretty close to the original PS1 games. I still have the amazing Resi 2 on N64 that I completed recently. It would be cool if it had a level editor you could upload for friends to try. Might have a look at it in the future. Those graphics are horrific and the stuff of nightmares. Still, graphics aren't everything and it could be interesting. I'll keep an eye on it. @stipey Yeah, limited numbers unfortunately. Still have it CIB, love me some retro action. This could be fun if the controls are not terrible. I love 90's survival horror so this could be interesting. It looks like it could use a few more months of development time though. Could still potentially be fun. Although the Resi influence is obvious, there does seem to be the odd touch of Alone in the Dark and the PlayStation Clock Tower game. Sure, why not?! I got the Twitter notification and didn't initially see the entire headline, and thought maybe Vaccine is the name of the studio porting 90s Arcade Racer to Switch! Looks fantastic. There's a game on Steam called Back in 1995 which is also a throwback to PS1 era Resident Evil style games. I bought it ages ago but I can never be bothered to game on my PC in the office. I'll definitely grab this when it launches. There's one good retro aesthetic to bring back. Awesome. One thing I notice though is that the letter "in" in the title Vaccine is highlighted. Having title with highlighted letters in title isn't a new thing as I also noticed in Resident Evil 7 the letter "vi" and half of the "l" in the word "Evil" is highlighted to represent the Roman numeral 7 whereas in its Japanese name, Biohazard 7, the angle half of the "z" is highlighted to represent the number 7 as well but what was the point of highlighting "in" in Vaccine? I feel this game is like the hot trashy girl. She's so trashy, but still pretty hot. Nice goofy genre fun, and it look like a legitimate challenge as well. Why, oh why have Capcom not released them on the Wii U eShop?!!!! I loved the RE1 port on DS (Resident Evil: Deadly Silence), warts, bad acting, tank controls, and all. I've always wanted to play the original RE2 as I would imagine it to be very similar. @BulkSlash I thought of this too exactly .. haven't played it yet but I will eventually. And yes I will be getting Vaccine. I finally got a working solution for extra WiiU storage so I'll be downloading all my backlog including new stuff like this. Really loving my Wii U. I can totally hold onto it this year and ignore Switch until Xmas/Black Friday deals. I love Resident Evil and this really gives me some strong RE vibes! Looks like a promising throwback to me! For years I've been wanting to see a retro game like this but inspired by the first Silent Hill, Frankly the concept of a rearranging dungeon would work well with Silent Hill. I don't know....and this is coming from a big resi fan, but the older traditional RE games game play wise do not hold up. I can't even be bothered to play the remake or zero anymore. @stipey I had it for N64, but it's been a long time and I no longer own it. Pretty much on-par with PS1 if I remember correctly. If this were a 3DS release (or even a New 3DS exclusive), I'd be all over it! The procedural nature lends itself to on-the-go play, I reckon. Here's hoping that's still a possibility, since I'd definitely grab and play it there. Ah, look at those awesome blocky minecraft graphics! Awful! This is actually the first throwback to that era graphics that looks promising. Everything else I have seen was too exact with brutal jaggies and horrible resolution. I'm getting Alone in the Dark vibes from this, not just RE. But the D&D popups are completely stupid and will ruin the atmosfear. Oh, and was that 1XP for opening a freaking door at the minute mark? @ULTRA-64 yeah, super expensive here in Australia. Goes for $1000 upwards, I paid $90! Currently have over 150 CIB. As much as I love some old-school Resident Evil, even back in 1996 tank controls were terrible. I tolerated them because I loved everything else about the series, but damn was I thrilled when RE 4 modernized the controls a bit. @Gamer83 Actually, RE4, like a lot of games, used tank controls too, it just had a different camera system. Yeah, it modernized them to make them less obnoxious. Didn't explain my point very well. I'd assumed you'd get sb kids 2 cheaper as it never came out in UK. Just NTSC/aus-pal??? I hate to be "that guy", but surely he is hunting for a "cure" for his friend, not a "vaccine"? I always thought a vaccine stops you catching something in the first place, but a cure gets rid if it once you already have it... or is this an "American English" thing? @Gamer83 you and me both. It's tough going back to the older RE titles because of the bare bones lack luster archaic combat especially when sided with the sheer versatility of something like RE4. The loading doors at least when back tracking drive me absolutely batty as well. Traditional RE got stale around the time Code Veronica came out....even with RE3 I couldn't help but think....ive got to do all of this again?? This looks very tempting. A Resident Evil type of game with a randomly generated house? Sounds very fun! The graphics? Nostalgia inducing. Tank controls? No problem, was standard back then. And oh, I miss my RE2 for N64. One of my games that got lost somehow, somewhere. No one's ever asked me, a tough question. I actually have about 30 or so like new games, some only played once. I'll post a link to my collection later if you like. 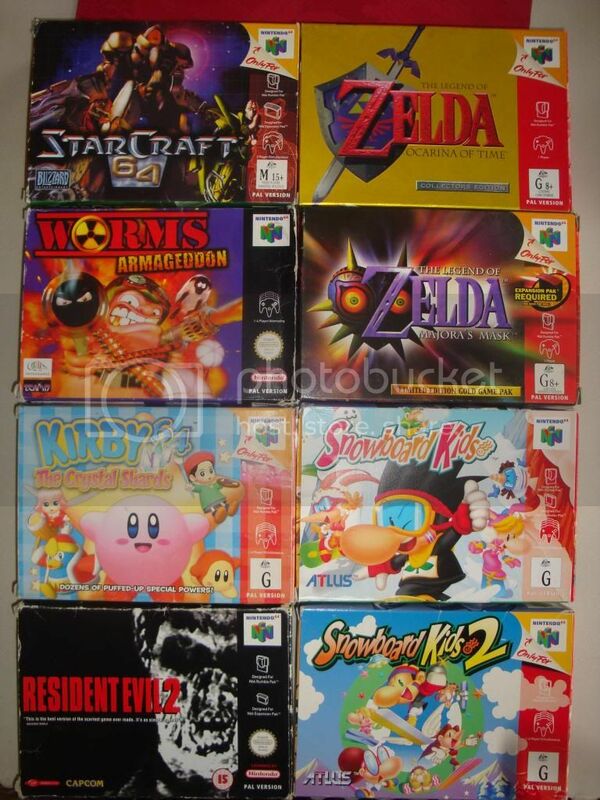 I'm going for a full collection of CIB 64 games. @KiWiiU_Freek yeah, some kind of link would be cool. I'm not a massive CIB collector like you, I have allot of loose stuff so I can play more otherwise I might have just 3 game's, but mint😂😂. Man, I wish mail order was cheaper from you, I'd be bumming for swaps!! @LemonSlice No, it just means you have control over turning, as opposed to automatically turning to face the direction you're moving in like in the 3D Mario games. I started with a handful of CIB games and it just grew. I love Rare's early work, so talented. You're going for killers not fillers as they say, going for the best, I can relate to that. It's not the most recent pics but it's got most of them. It also has some of my other games for different consoles but Nintendo is my lifeblood. Aidyn Chronicles gets really good prices. @SeriousSam Thanks, I researched the term quite a bit after I posted, hence why I deleted my post. @stipey And it was a really good conversion for the most part too. @Churchy Well, all three would be great games to use as reference in designing a classic survival horror title. Will definitely give this ago.